Description: A2 Coloured Poster created as a generic anniversary poster as part of the "Centenary Collection". This piece was created using a 1/20th scale model bow/prow from the 95th Anniversary poster, a digital drawing of the Titanic and mixing it with various real photography elements. 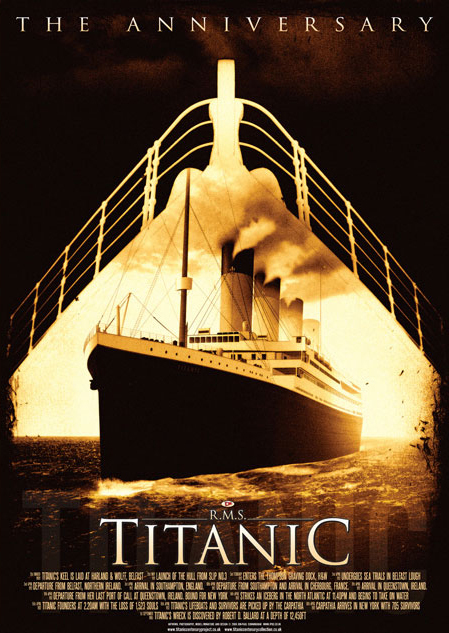 This poster has a detailed timeline of key dates in the Titanic's history along the bottom. This piece was used as the official Titanic Branson and Titanic Pigeon Forge Museums in the USA back in 2010 and was also on sale at various Titanic Society meetings, Historical locations such as the Titanic Dock & Pump-House, Belfast, Northern Ireland, and also at various Maritime events throughout Europe. Poster prints available to purchase!